Spinal Cord injury can occur as a result of non-traumatic causes (16%) and traumatic causes (84%), although recent studies indicate a slight trend in recent years towards an increase in the share of non-traumatic spinal cord injury. Non-traumatic spinal cord injuries occur as a result of disease, infection and congenital defects with the leading causes being neoplastic tumors and degenerative conditions of the spinal column, followed by vascular and autoimmune disorders. 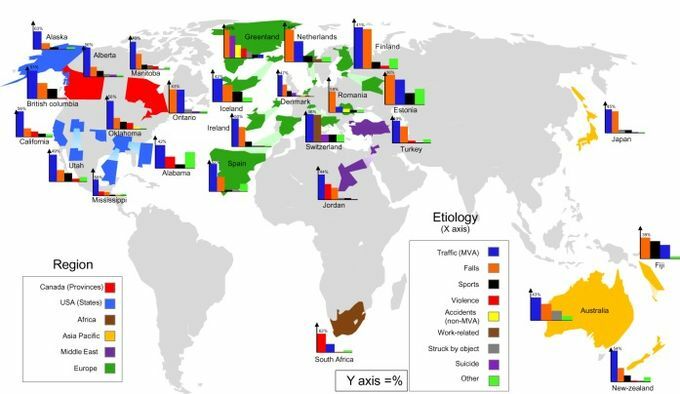 Causation of Spinal Cord Injury in Various Countries  Notes: A global map illustrating the causation of SCI between regions. The y-axis of the bar graphs indicates the percentage of contribution, while the x-axis categorizes the reported etiologies from highest to lowest from left to right (except for other causes, which is represented on the far right). Sports included diving. Violence included both gunshot and stab wounds resulting in SCI. Accidents represent all nontraffic accidents, including falling weight and crushing accidents. Abbreviations: MVA - Motor Vehicle Accidents; SCI - Spinal Cord Injury. The incidence of a disease is the number of new cases in a population at risk in a given time period.While a relatively rare condition, spinal cord injury is life altering and costly, both for health care systems and the individual, with a mortality risk that varies widely by country and depends heavily on the availability of quality and timely clinical care and rehabilitation services. Relative Annual Incidences of Countries, States/Provinces, and Regions. Notes: The red color scheme illustrates incidences of countries. The blue color scheme highlights incidences of states/provinces and regions. Abbreviation: mil - million. ↑ 1.0 1.1 1.2 1.3 1.4 1.5 1.6 1.7 World Health Organization, International Spinal Cord Society. International Perspectives on Spinal Cord Injury. World Health Organization; 2013. ↑ 2.0 2.1 2.2 2.3 2.4 2.5 2.6 Singh A, Tetreault L, Kalsi-Ryan S, Nouri A, Fehlings MG. 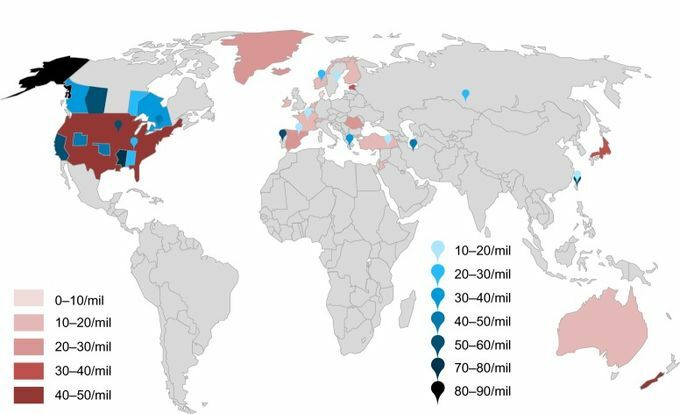 Global Prevalence and Incidence of Traumatic Spinal Cord Injury. Clinical Epidemiology. 2014;6:309. ↑ 3.0 3.1 3.2 3.3 3.4 3.5 Furlan JC, Sakakibara BM, Miller WC, Krassioukov AV. Global Incidence and Prevalence of Traumatic Spinal Cord Injury. Canadian Journal of Neurological Sciences. 2013 Jul;40(4):456-64.